High plasma uric acid (UA) is a precipitating factor for gout and renal calculi as well as a strong risk factor for Metabolic Syndrome and cardiovascular disease. The main causes for higher plasma UA are either lower excretion, higher synthesis or both. Higher waist circumference and the BMI are associated with higher insulin resistance and leptin production, and both reduce uric acid excretion. The synthesis of fatty acids (tryglicerides) in the liver is associated with the de novo synthesis of purine, accelerating UA production. 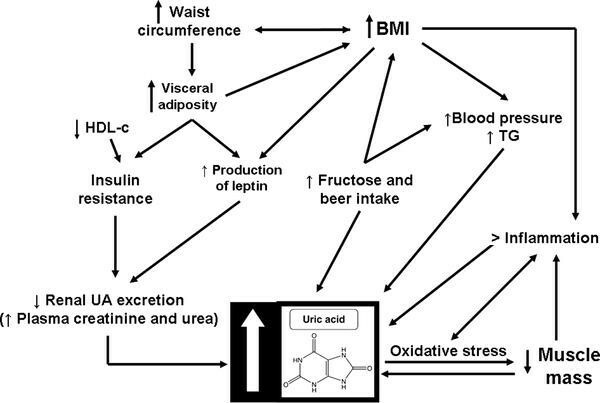 The role played by diet on hyperuricemia has not yet been fully clarified, but high intake of fructose-rich industrialized food and high alcohol intake (particularly beer) seem to influence uricemia. It is not known whether UA would be a causal factor or an antioxidant protective response. Most authors do not consider the UA as a risk factor, but presenting antioxidant function. UA contributes to > 50% of the antioxidant capacity of the blood. There is still no consensus if UA is a protective or a risk factor, however, it seems that acute elevation is a protective factor, whereas chronic elevation a risk for disease. High plasma uric acid (UA) is a prerequisite for gout and is also associated with the Metabolic Syndrome and risk factors for cardiovascular diseases [1–4]. Hyperuricemia increase in 16% all causes of mortality and 39% of total cardiovascular disease . The hyperuricemia is defined as ≥7 mg/dL for men and ≥6.0 mg/dL for women , and is found mainly in postmenopausal women, African American, patients with renal disease and alcohol intake . Furthermore, many factors can influence the concentrations of UA, eg. diet, obesity, and Metabolic Syndrome [1, 8–10]. However, we still don't know if UA is a protective factor for the moderate oxidative stress in these situations or if it's a risk factor. The aim of this review was to discuss the function of the UA in our organism and the main causes and consequences of the higher concentration of UA. Uric acid (2,6,8 trioxypurine-C5H4N4O3) is an organic compound that is endogenously produced by animals as a purine metabolite. It is formed by the liver and mainly excreted by the kidneys (65-75%) and intestines (25-35%). UA is the end product of purine metabolism in humans due to the loss of uricase activity, which led to humans having higher UA levels than other mammals [11, 12]. Due to its double bonds, uric acid has excellent antioxidant capacity, and it can be responsible for 2/3 of total plasma antioxidant capacity [13, 14]. Because it is a weak acid that have a high dissociation constant, uric acid circulates in plasma (pH 7.4) predominantly (98%) in the form of a monovalent sodium salt (urate) . It shows low solubility in water (as well as in plasma), and it would theoretically reach plasma saturation in the concentration of 6.4 mg/dL, which may not occur because solubility increase is provided by its binding to proteins, namely albumin, which is its main transporter. Protein-bound uric acid shows plasma solubility that is 70% higher than in its free state . Uric acid pathogenesis is usually associated with gouty arthritis or nephrolithiasis . High uricemia pathogenicity is associated with its low solubility in the extracellular environment leading to crystal formation, low affinity (and deposition) to certain tissues and antigenicity (after crystal phagocytosis). This mixture of quantitative and qualitative etiological hyperuricemia factors is confounding because normouricemic individuals may show symptoms while others with hyperuricemia may not. In the clinical context, hyperuricemia is seen as a prognostic indicator of renal disease, diabetes mellitus, cardiovascular disease and inflammation [7, 17–23], thus being a (modest) risk factor for mortality . Physiologically, uric acid plasma concentrations increases with age; they are smaller in women of childbearing age and, in post menopause women, it increase to similar values to those found in males [2, 3]. The balance between uric acid production and excretion in males shows a turnover of 600- 700 mg/day for a pool with a maximum of 1,000 mg, as shown by isotopic studies. Uric acid entry into the pool is controlled by hepatic production, which receives endogenous (nucleoproteins) and exogenous (dietary) precursor proteins. Uric acid exit from the pool in males is mainly controlled by the kidneys and by urine-forming factors, renal plasma flow, glomerular filtration and tubular exchange [24, 25]. In the kidney, uric acid and urate are initially filtered and additionally secreted. However, the largest part (90%) is usually reabsorbed and returns to blood . The factors that can influence the uptake of urate by the kidney are: plasma concentrations, volemia and renal plasma flow modulators. At this point, renal excretion of urate follows the same extra-renal limiting factors as those of glomerular filtration. Kidney participation is associated with glomerular filtration (90% filtrate), proximal reabsorption (by an active process) and post-secretory resorption in the distal tubule, ascending loop and collecting duct. In this phase, the renal excretion of urate follows the limiting factors that accompany renal diseases (glomerular and medullary). The urate renal excretion phase is that of post-secretory resorption . Proximal tubular reabsorption of uric acid is competitive with monocarboxylic organic acids, and it can be inhibited by oxalic acid, lactic acid and ketone bodies (acetoacetic and beta-hydroxybutyric acids). Metabolic situations with higher production and circulation of such acids are accompanied by the hypoexcretion of uric acid in urine . Lactic acid is a product of anaerobic glycolysis (NADH-dependent) in alcoholics, resulting from the metabolism of ethanol (due to higher NADH production), and in inflammation/infection (due to PDH inhibition by pro-inflammatory cytokines) . Ketone bodies are produced in the liver by partial oxidation of acetyl coenzyme A due to excessive peripheral lipolysis. Ketonuria occurs in decompensated diabetic individuals and in acute fasting (weight loss by carbohydrate-restricted diets). Factors that increase uric acid urinary excretion: extracellular volume expansion and tubular resorption inhibition . Acute renal failure can also rise UA by decreased of renal excretion . Furthermore, the consumption of some drugs are associated with the raise of serum UA (ciclosporin, ethambutol, pyrazinamide, cytotoxic chemotherapy). On the other hand, other drugs (benzbromarone, losartan, probenecid, sulfinpyrazon) diminishes the UA concentration mainly by the inhibition of a specific anion transporters (URAT1), that is responsible for the reabsorption of renal uric acid, which explain the uricosuric effect of these drugs . Purine bases and their nucleotides are rapidly captured by the liver  and converted into xanthines, metabolized by uric acid or recycled by salvage pathways or de novo synthesis, and the latter requires a higher energetic cost (ATP consumption) . Uric acid formation by xanthine occurs via hypoxanthine by the action of xanthine oxidase . In most mammals, uric acid is converted into allantoin by uricase and later into urea, which are excreted. For this reason, uricemia in these animals corresponds to 10% of human values [30, 31]. Diseases accompanied by great cell depletion, such as leukemia, leukocytosis and dystrophies can increase the provision of nucleic acids to the liver and result in a larger production of uric acid. Hence, diseases resulting from innate purine metabolic errors may also result in hyperuricemia [2, 3, 12]. The relation between diet and UA has not yet been fully clarified since most studies have not estimated basal urate concentrations, have not excluded confounding factors or have not even correctly evaluated ingested nutrients . The human diet is very poor in urate, which is produced mainly in the liver and to a less extent in the small intestine. The production of UA depends of purine ingestion , however, a purine-rich diet would be responsible for an increasing only in 1 to 2 mg/dL of UA [33, 34]. It is recommended that individuals with hyperuricemia should not ingest a large amount of purine-rich food (for instance, veal, bacon, kid meat, mutton, turkey, pork, duck, goose, etc.) , and it is suggested that a high intake of meat and seafood are related to increased UA, but the same relation is not valid for total protein intake . During fructose metabolism, the phosphorylation of such monosaccharide into fructose 1-phosphate occurs by means of enzyme fructokinase. Next, enzyme aldolase B breaks fructose 1-phosphate into dihydroxyacetone phosphate (DHAP) and D-glyceraldehyde. When high fructose intake occurs, fructose phosphorylation into fructose 1-phosphate is fast, but the reaction with aldolase is slow. Hence, fructose 1-phosphate accumulates, and inorganic concentrations of intracellular phosphate also decrease. The low availability of phosphate limits ATP formation (ADP + Pi), and ADP or AMP resulting from such metabolism is catabolized, thus leading to hyperuricemia . There are other ways to increase urate concentrations, such as the intake of sorbitol, sucrose, lactate and methylxanthines . After absorption, sorbitol is converted into fructose by the liver, and thus, it can increase UA production [39, 40]. Fruit and vegetables, in addition to flavonoids, can contain other nutrients that can affect the plasma total antioxidant capacity (TAC). Lotito & Frei (2006)  reported that the TAC increase observed after the intake of these flavonoid-rich food types is not specifically caused by flavonoids because such nutrients are probably highly metabolized after ingestion. Possibly, what would increase TAC would be the UA elevation resulting from fructose metabolism. The mechanism for such elevation would be the degradation of purine nucleotides or UA excretion reduction [41–43]. High vitamin-C intake shows an inverse relation with UA  as such vitamin has a uricosuric effect due to competition of UA renal resorption through a change in the anion transportation system in the proximal tubule [45, 46]. Beer intake is an independent factor from UA increase  both due to its alcoholic content and high-quality purine . Beer intake has a stronger power to increase UA than liqueur, but moderate wine intake does not increase UA [36, 48]. Alcohol intake increases UA concentrations by reducing excretion [49, 50] and increasing urate production . Dairy product intake has an inverse relation with UA [32, 36, 52]. Probably, the mechanism for such association is due to milk-forming proteins (lactalbumin and casein), which have a uricosuric effect . There is an inverse relation between coffee intake and UA concentrations , but such association seems to be due to other substances, as it does not seem to result from caffeine. Decreased UA concentrations would result from the improved insulin resistance observed with increased coffee intake, which occurs mainly due to chlorogenic acid, an antioxidant found in that drink [54, 55]. Tsunoda et al. (2002)  observed the effects of hypocaloric diets on uric acid in overweight individuals. This type of diet indirectly decreased UA serum concentrations because it improved insulin sensitivity in these individuals, and this occurred regardless of changes in body weight or blood pressure. Gout is caused by articulation deposition of monosodium urate crystals after chronic hyperuricemia . It affects 1-2% of adults in developed countries  and is considered an independent risk factor for cardiovascular disease . Uric acid values higher than 7.0 mg/dl is a risk factor for the development of gout . Renal calculi are formed by calcium salts deposited on an organic matrix of oxalate or urate. Their formation occurs in the glomerular filtrate in acid (oxalate or urate) or alkaline (carbonates and phosphates) pH in the presence of high calciuria (hyperparathyroidism or bone demineralization). They are usually formed and then dissolved, but under abnormal pH variation or filtrate concentration conditions, they may remain until excretion . The contribution of UA to renal stone formation has an important role in progressive renal failure . Meta-analysis has recently shown that UA elevation is related to an increase in (coronary artery disease) infarction and mortality events , and epidemiological studies showed that UA is an independent risk factor for cardiovascular diseases [5, 10], particularly in hypertensive and diabetic individuals . It is also speculated that UA is one of the determinants of the metabolic syndrome . Individuals with high UA levels have an odds ratio of 1.6-fold higher for developing MS .
UA is associated with Metabolic Syndrome  and its components , obesity, dyslipidemia, hypertension , insulin resistance (metabolic syndrome), increased C-reactive protein (PCR) concentration  and endothelial dysfunction , or even, to risk factors for cardiovascular diseases [7, 17, 19]. UA increase is observed in individuals with insulin resistance, probably because hyperisulinemia would cause lower renal UA excretion . Additionally, insulin could indirectly act on UA, since there is an association between hyperinsulinemia and hypertriglyceridemia. Some studies show that high concentrations of plasma triglycerides are related to hyperuricemia [58, 62–64]. There are some explanations for such relation, and one of them is that during triglycerides (TG) synthesis there would be a greater need for NADPH . The synthesis of fatty acids in the liver is associated with the de novo synthesis of purine, thus accelerating UA production . Chen et al. (2007)  observed negative correlation between HDL-c and UA. The likely mechanism is the relationship between decreased HDL-C and insulin resistance . Confirming this hypothesis, our research group showed that when adjusted for the other MS components, the relation between UA and HDL-c is lost . In the adipose tissue, there is adipokine production, including that of leptin. One possible explanation for the association between higher waist circumference and hyperuricemia were suggested by Bedir et al. (2003)  and Fruehwald-Schultes et al. (1999)  which studies found that UA serum concentrations are independently related to leptin concentration, thus suggesting that would be a pathogenic factor responsible for UA increase in obese patients . Some authors report UA to be responsible for blood pressure increase, and others show arterial hypertension (AH) to be a risk factor for hiperuricemia. UA inhibits the bioavailability of nitric oxide, which is a vasodilator , and, on the other hand, AH would lead to vascular disease and increase renal vascular resistance. Both of these processes reduce renal flow, thus increasing urate resorption . A recent study showed an inverse relation between muscle mass (MM) and UA in healthy individuals older than 40 years . Chronic elevation of UA concentrations would be a causal factor for sarcopenia, especially through increased inflammation and oxidative stress [72, 73]. The activation of the xanthine oxidase metabolic pathway, which increases UA production and the superoxide radical  could elevate the reactive oxygen species (ROS) and it could be the main mechanism for the reduction of MM. Furthermore, UA exerts a pro-inflammatory effect, thus stimulating the production of interleukin-1, interleukin-6 the tumor necrosis factor which also can influence the muscle mass . It is not known whether UA would be a causal factor or an antioxidant protective response against oxidative stress . While chronic high UA concentrations are associated to increased risk for CAD, acute elevations seem to provide antioxidant protection . UA contributes to > 50% of the antioxidant capacity of the blood . Furthermore, the UA has a protective action in vitamins C and E  with the stabilizing activities in these vitamins [79, 80] and the presence of ascorbic acid in plasma is required for the antioxidant effect of UA . Also, it has a direct effect on the inhibition of free radicals such as peroxyl radical and peroxynitrite, protecting the cell membrane and DNA [81, 82]. Most authors do not consider UA as a detrimental factor to the body health, because of its antioxidant function [8, 83]. The antioxidant activity of UA also occurs in the brain , being a protector for several disease such as multiple sclerosis and neurodegenerative disease. Higher concentration of UA is associated with lower risk of development of Parksons disease and a favorable effect at the disease progression mainly . Several factors are associated as cause and consequences of high UA concentration. Higher waist circumference and BMI are associated with higher insulin resistance and leptin production, and both reduce renal uric acid excretion, thus increasing its concentration. HDL-c concentration is negatively associated to insulin resistance, what can influence its negative correlation to uric acid. Obese individuals usually have Metabolic Syndrome diagnostic, which can also increase uric acid serum concentrations due to synthesis increase (triglycerides - TG concentration) and lower excretion (arterial hypertension - AH) (Figure 1). Determinants of hyperuricemia. UA = Uric Acid, BMI = Body Mass Index, TG = triglycerides. Additionally, obesity and muscle mass (MM) reduction are associated with low-intensity chronic inflammation, and uric acid levels can increase in order to protect the organism against the moderate oxidative stress resulting from this situation. Low muscle mass (sarcopenia) is negatively associated with uric acid, However, it has not yet been clarified what the cause or effect is. Probably, oxidative stress produced by excessive uric acid can influence muscle mass reduction. The role played by diet on hyperuricemia has not yet been fully clarified, but high intake of fructose-rich industrialized food and high alcohol intake (particularly beer) seem to influence uricemia. The main mechanism of excretion of urate concentrations occurs by means of renal excretion; hence, glomerular function markers (urea and creatinine) are positively associated with uric acid (Figure 1). Furthermore, there is still no consensus if UA is a protective or a risk factor, however, it seems that the quantity and the duration of the concentration of the uric acid in the blood is essential for this answer. Acute elevation seems to be a protective factor, whereas chronic elevation a risk factor. EPO wrote the manuscript, RCB read and corrected the final version of the manuscript. All authors read and approved.